It’s in these moments of warmth which James best suits her idiosyncratic vocal stylings too. Her vocals are enough to cradle even the most despondent baby to sleep, even if, conversely, her gentle delivery may not be for everyone. This is why James’ sensual delivery of the gypsy track “Who Loves You More” is almost as astounding as the level of effervescence placed into her violin on the lively roots composition “Eva’s Dance”. The fullest extent of James’ freedom on Black Beauty is perhaps best perceived when listening to her exotic instrumental cover of Azerbaijani folk song “Ayrilliq”, which, by all means, is a spectacle to behold. James also offers listeners her own interpretations of American folk staples, like Bob Dylan’s “I’ll Be Your Baby Tonight” and Woody Guthrie’s “Hobo’s Lullaby”. While not as viscerally affecting as the source material, given heightened production values and the distinction of James’ angelic tone as compared to the earthy twang of a Dylan or Guthrie, they are enjoyable, listenable versions of the songs that are done up with respect. It’s James’ skills as a violinist which make the entirety of Black Beauty shine, adding a hefty dosage of individualistic personality to the aforementioned cover songs and placing further musical stock into original compositions. Though Black Beauty is billed as a James’ solo venture, she is still offered backup by her Cowtown compadres Whit Smith and Jake Erwin, as well as other featured guests such as Cindy Cashdollar and Erik Hokkannen, on certain tracks. Hokkannen in particular offers some great, effortless classic country guitar picking to the before-mentioned “Eva’s Dance”, whereas Cashdollar offers her dobro, steel guitar, and Weisenborn guitar on album-closer “Waltz of the Animals”. 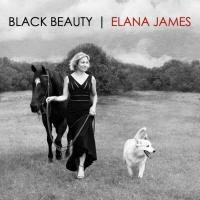 Lyrically, Black Beauty is sound, with its best moments being had in true respect and admiration of traditional western music and all of its ins and outs, and with a few standouts for James, as well, such as in the emotional “Hey, Beautiful” letter which she had written a composition around. All in all, Black Beauty is a fine first showing for what James can do on her own. Sometimes it’s a little too sweet, or a little too melodically straightforward, so it won’t go inviting the Americana-unhinged any further towards the front door entrance, but for genre diehards, it is a sonic treat.